Cover Crazy (which I'm renaming Friday Covers) is a weekly meme hosted by Tawni at The Book Worms. The point of this meme is to admire the art and beauty of a book’s design. In my interpretation, I'm not only admiring cover during this meme, but criticizing them as well. For me, covers are what first catches my eye. I try to leave judgment for the actual book summary, but it is hard when the cover is not appealing. I think visually representing the book correctly is an important aspect of marketing, and definitely makes or breaks a book's sales. 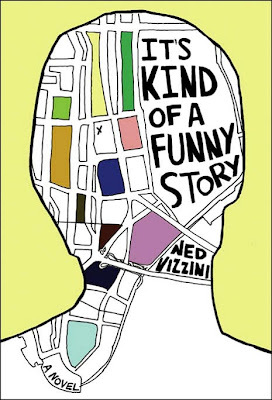 For this Friday Covers I'm looking at Ned Vizzini's It's Kind of a Funny Story. This is the original release of the paperback cover. I love this cover so much. 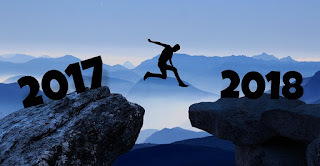 In the book Craig, the protagonist, buckles under the pressure of his super competitive new high school, resulting in his thoughts of suicide. He checks himself into the mental hospital, where he proceeds to learn a lot more about himself then any place else. During his stay he starts to draw maps representing the different people he meets. The reflection of that talent in the cover is awesome. Within the supposed head of Craig, is a partial map of Manhattan, the setting of the story. It is simple with lines and geometric shapes, which brings the eyes to it. The simplicity and bright colors are also eye-catching. All in all one of my favorite covers. Now we move on to the movie tie-in cover. I do not like this cover one bit. The only thing that makes it even decent at all is the inclusion of Noelle and Bobby, two other psych patients which help Craig deal with everything. But other than that, nothing is good about it. The pictures aren't really interesting and the colors are much duller. 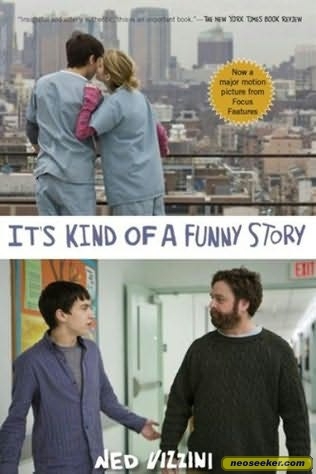 I think the biggest one that is bringing the cover done is the picture of Keir Gilchrist as Craig and Zach Galifianakis as Bobby. It doesn't add anything, and has a lot of muted colors. At least with the top Picture with Gilchrist and Emma Roberts, as Noelle, this is the implied romance and the city in the background. I feel like when the movie tie-in comes out the book looses it's integrity a tiny bit. I know the point is to (1) let consumers know that the book is there, (2) to make money, but it makes me so angry when there is a flood of the movie tie-in cover and the original, which is almost always 10x better, gets lost or never carried in the store again. Anyway that's all I really have to say. Let me know in the comments what you think of the different covers, or if there is a book that you can think of which had that happen to it. I agree on your analysis - the original cover is much better.